San Francisco Giants third baseman Pablo Sandoval became one of the team’s most popular players during his time with the team. It was only reinforced during the Giants’ postseason run and World Series victory, with Sandoval hitting .366 with a .423 OBP and 5 RBIs. The Giants offered Pablo the same contract given to Hunter Pence, five years at $US90 million. Sandoval wanted that deal last Spring when Giants were justifiably suspicious about Pablo’s physical condition. But when that offer came after the World Series, Sandoval countered by asking for a seven year deal. Sandoval was in Boston yesterday where I am told there is a 90 per cent chance that he will sign with the Red Sox. The other 10 per cent goes to the Toronto Blue Jays. There doesn’t seem to be a known, specific reason why Sandoval wants to leave San Francisco, the reigning champs, and city that loves him. It may just come down to money and the Giants’ suspicions about his condition. In 2011, the Giants publicized “Operation Panda” to encourage Sandoval to lose weight, and he did. Throughout his career, his play has fluctuated with his weight. 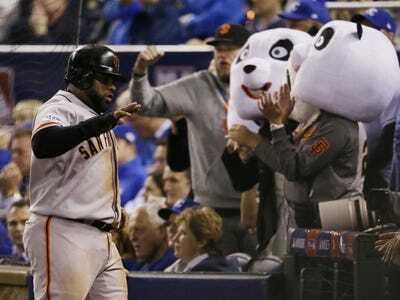 Sandoval won the 2012 World Series MVP, and has been part of the Giants’ three World Series victories in five years. His popularity may take a hit if he pursues a pay raise, although O’Donnell reports that the Giants are still considering upping their offer to keep him.